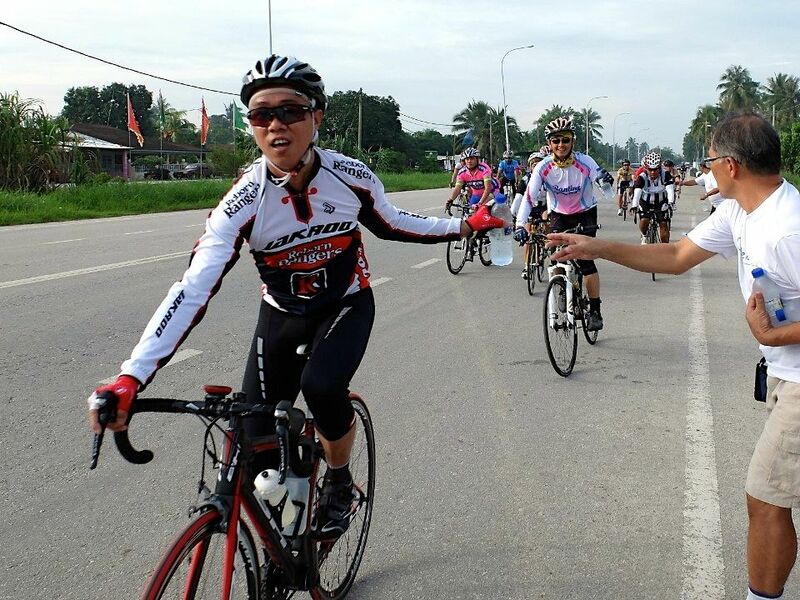 The two-day ride to Teluk Intan and back has become a favourite for the R@SKLs. Seven of us did this ride in January 2018. The main attraction of riding to Teluk Intan is a dinner of Macrobrachium rosenbergii, better known as giant freshwater prawn. 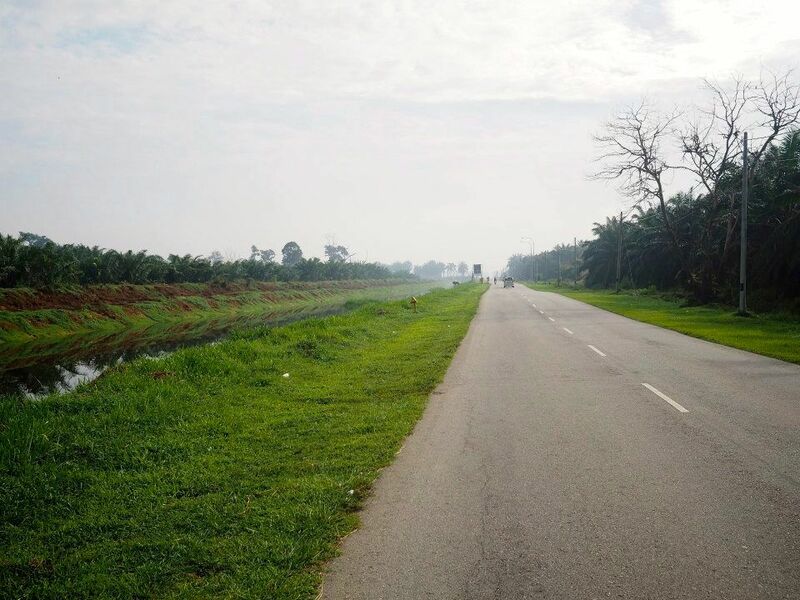 Other attractions of this ride are the doable-in-one-day distance of about 145km / 90mi, the number of quiet backroads along the route, and the cyclist-friendly Yew Boutique Hotel in Teluk Intan. 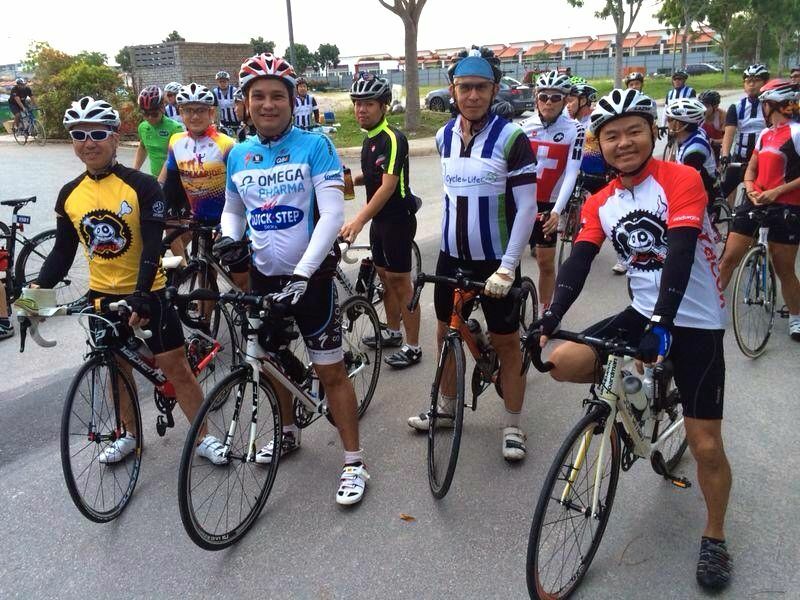 Not to mention being able to start and end the ride from Pai’s factory premises in Kapar. For a start, we get assigned parking in a secure parking lot. Plus access to restrooms, showers, and a water cooler. Wonderful! Fourteen of us were ready to roll out of the Adtek car park at 6.00am. Including Natasha and Marco, who were celebrating one year of wedded bliss. The first forty minutes of the ride was spent negotiating roads which have been damaged by a constant flow of heavy lorries. Street lighting was poor in places, so everyone had to be on full alert for potholes, bad patch jobs, and road debris. The sun was peeking over the horizon as we turned right off Route 5 and onto Jalan Suara. These were the roads we were looking forward to riding on. Naturally, everyone was glad to be off the main trunk road that is Route 5. Whenever there was a river to cross we had no choice but to get back onto Route 5. The first of the bridges was at the small town of Sungai Buloh (literally Bamboo River). One would expect the river there to be the Sungai Buloh, but it is not. We crossed the Sungai Sembilang and endured Route 5 for 1.5km / 0.9mi before we were able to turn right onto Jalan Tok Empat Yusuf. We had 10km / 6mi of quiet backroad almost entirely to ourselves before we had to get onto Route 5 again for the Sungai Selangor crossing at Kuala Selangor. I had planned for our breakfast stop to be between Sungai Buloh and Kuala Selangor, in a roadside stall at the crossroads between Jalan Teluk Piah Kanan and Jalan Kuala Selangor. We had stopped there for breakfast the last time we rode to Teluk Intan. So imagine my dismay when I got there, with thirteen hungry cyclists behind me, to find the stall partially demolished. Some of the R@SKLs were very hungry. I know from past experience that hungry cyclists tend to lack a sense of humour. Luckily for me, some scouting around by the group revealed that the now-demolished stall had morphed into a bigger and better restaurant just around the corner. Around the time we were finishing breakfast, some other R@Skls were starting their Sprint Race at the Port Dickson International Triathlon 2018. 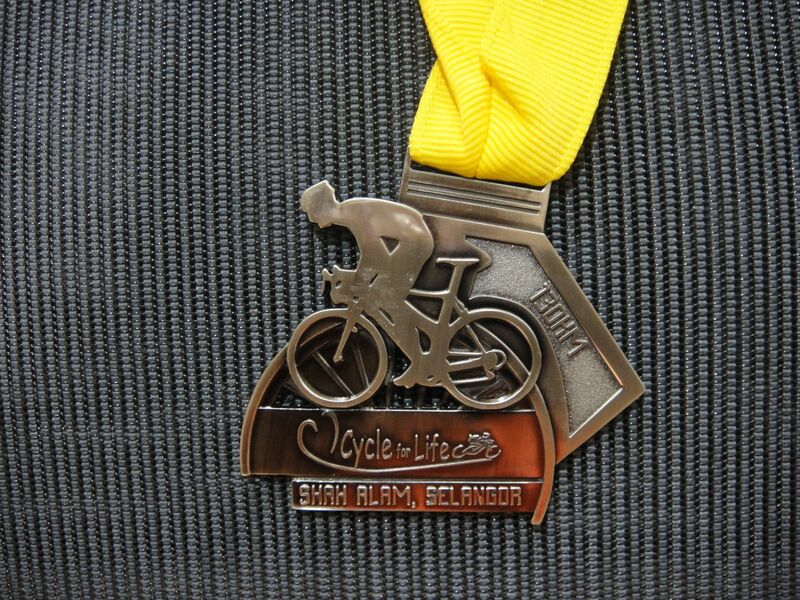 750 meter open water swim, 20km bike ride and 5km run. Way to go! After breakfast, we made it safely back onto Route 5 and over the bridge at Kuala Selangor. After exiting Route 5 at Jalan Sungai Tunggul, we would be on roads through paddy fields and rural countryside for the next 67km / 42mi. We had covered about 58km / 36mi at a reasonable moving average of 25kph / 15.5mph by the time we got to the far edge of the paddy fields. We turned left onto Jalan Terusan Utama, which we would stay on for the next 30km / 19mi. A group of seven pulled ahead on the flat, straight and quiet road. The rest of us were rolling along at a slightly more restrained pace when Jeff went down. He was clearly in pain from an injured shoulder and was unable to continue. We tried hailing down passers-by in vehicles big enough to carry both Jeff and his bicycle but were unsuccessful. Fortuitously, there is a rice milling plant, Dataran Pusaka Sdn. Bhd., 300 meters from where Jeff had his accident. Even more fortuitously, someone from there was willing to load Jeff and bike into his pickup truck and to take them to the nearest town, Sekinchan. The seven of us who had stopped at the scene rode the 7km / 4mi to Sekinchan. Jeff was in a clinic waiting to be checked out. In the meantime, Simon had been on the ‘phone with Alfred, whose family was en route to Teluk Intan in an MPV. Alfred’s wife agreed to stop in Sekinchan to pick Jeff up from the clinic. Once we were sure that Jeff was in good hands at the clinic, and that he would be picked up from there, we headed back to Jalan Terusan Utama to continue along our route toward Sabak Bernam, which was our predetermined lunch stop. The group ahead of us had stopped at a roadside shop while awaiting an update on the situation in Sekinchan. With Jeff sorted out, they rode on to Sabak Bernam. The rest of us were at least an hour behind them, so they had lunch as soon as they arrived in Sabak Bernam. Then, clearly overcome with concern for Jeff, they had a massage! Lay and Heng Keng were waiting for us at Kedai Kopi Nam May. It was almost 2.00pm. The coffee shop staff were a bit concerned that they did not have enough food left to feed us. But their worry turned out to be unwarranted. We shared three platters of delicious fried noodles with fish cake. Massages over and reunited as a group again, we got rolling. It is a bit under 40km / 25mi from Sabak Bernam to Teluk Intan. Those who had done the ride in January were not looking forward to the first five or six kilometers. For a start, we would be back on Route 5. In January there were major roadworks in progress between the town and the bridge over the Sungai Bernam. Lane closures and an awful road surface made riding that section a nightmare. We needn’t have worried. The roadworks are complete and that section of road is now a pleasure to ride on. We also had a significant tailwind to help us along. Having averaged 34kph / 21mph for 13km / 8mi in 35° C / 97° F heat, we need to cool down when we got to the Petron station at Hutan Melintang. The wind was still a help over the final 16km / 10mi to Teluk Intan. The Menara Chondong (Leaning Tower) in Teluk Intan is the symbolic finishing line for this ride. Congratulations to the first-time riders to Teluk Intan: Kenix, Natasha, Martin, Jake, and Alfred. My Biker Chick had checked everyone into the Yew Boutique Hotel and was waiting with room keys for us. We parked our bikes in the Cyclists’ Corner off the lobby and headed to our rooms to shower and change into fresh clothes. All except Alfred. Jeff had been diagnosed with a suspected fracture, and Alfred’s wife had driven him from Sekinchan back to a hospital in Kuala Lumpur for further checks. It wasn’t until she had driven back to Teluk Intan that Alfred got a change of clothes. Some people, including me, dashed off so quickly to their rooms that they left things behind in the hotel lobby. After getting cleaned up, some of us met at the food court next door to the hotel for the famous chee cheong fun, and to claim our forgotten belongings. We gathered in the hotel lobby at 7.10pm to either walk, cycle or drive to Restoran d’Tepian Sungai for aforementioned udang galah (giant fresh water prawn) dinner. 11.5kg / 25lbs of udang galah. I have waxed lyrical in the past about the udang galah dishes at Restoran d’Tepian Sungai. They were just as good this time. We had the pleasure of some non-cyclists this time too. Apart from my biker chick and Alfred’s wife and daughters, we were joined by Marvin’s wife, his two young children and his mother. We missed Jeff though. We all hope he heals up fast and completely. You would have thought that after all we ate throughout the day, we would have been stuffed. If you did think that, then you don’t know the R@SKLs. After dinner, we walked to the Menara Chondong to take some more photographs. That worked up a thirst in some of us. On the way back to the hotel six of us stopped at the Chris Café for a coffee and lemon cheesecake tarts. I was in bed and fast asleep by 10.30pm. The FIFA World Cup 3rd and 4th place playoff match was broadcast starting at 11.00pm. I don’t think anyone stayed awake to watch it. 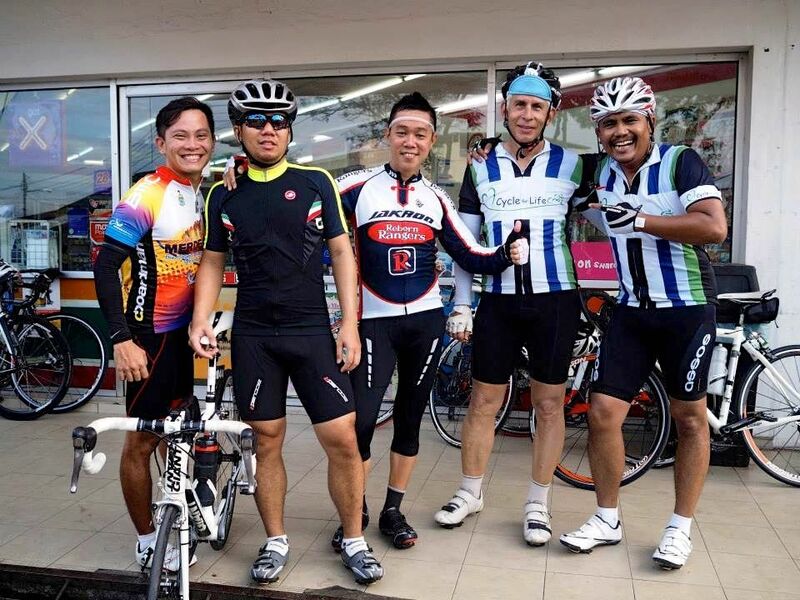 Posted in Cycling in Malaysia and tagged Chris Cafe, Kapar, Restoran D'Tepian Sungai, Teluk Intan, Yew Boutique Hotel. Bookmark the permalink. When I first read the terms “Audax,””Brevet” and “Randonneurs,” I had to look up what they meant. Audax: A cycling sport in which participants attempt to cycle long distances within a pre-defined time limit. Audax is a non-competitive sport: success in an event is measured by its completion. Also known as Randonneuring. Brevet: A long-distance bicycle ride with check-point controls. Also known as a Randonnée. Randonneur: A rider who has completed a 200km event. Apart from noting that audax is an excuse to market hi-viz jerseys for brevets (see the zipped chest pocket for carrying a brevet card), I thought little more about that variety of cycling. Some time later I read an online article in CyclingTips titled “Paris-Brest-Paris – Never Again.” Written by James Fairbank, a finisher of the 2011 edition of the quadrennial 1,200km brevet from Paris, to Brest, and back again in a time limit of under 90 hours. Then I read the accounts of four other riders who also completed the 2011 Paris-Brest-Paris in “PBP 2011: Four Journeys” on the Rapha website (the provider of the Brevet jersey above). 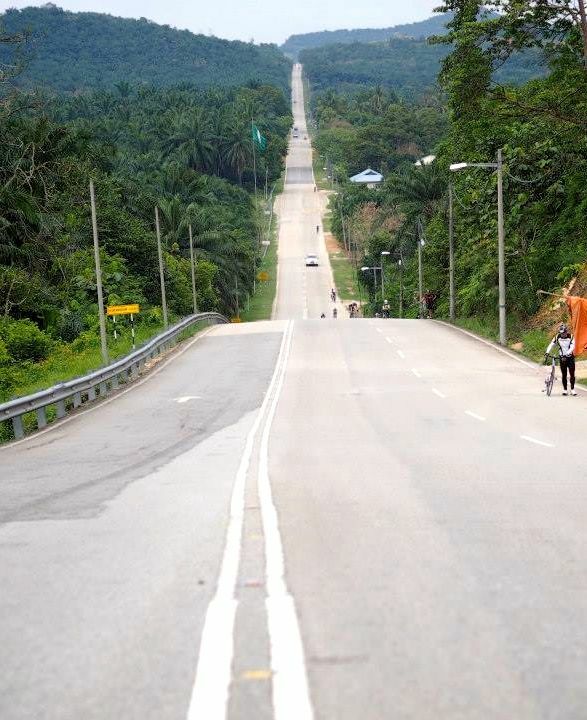 So when I was invited to participate in the first Official Audax Brevet in Malaysia (thanks Yue-Jin), I thought “No way!” 220km / 137mi was further than I had ever ridden in one sitting, so to speak. Which led to ten of my buddies and I being amongst the 480 or so mad folk who registered for this event. Here we are in Kapar, ready for the 5am start. We collected our brevet cards and then rode off into the darkness. Fortunately we didn’t have to make any turns during the first two hours. In the dark I couldn’t read the nifty cue card that Liang had made for us. Brevet routes are not marked, so this cue card taped to my top tube was consulted often after we got past the first check-point. By sunrise we had reached Sekinchan on our run northwest up the coast. Just before 8am we rolled into the first check-point at the McDonalds in Sungai Besar. We needed breakfast, but an Egg McMuffin didn’t appeal. So some of us went on a hunt for roti canai. Which we found at what is apparently Sungai Besar’s oldest Malay restaurant. I think the wait staff were a bit surprised to have a dozen lycra-clad guys turn up together. All demanding food. Six more of these please! By the time we got going again the sun was breaking through the clouds. The weather forecast had called for continuous rain, and I had come prepared with a rain jacket and shoe covers. We were all looking forward to the cooler temperatures that rain brings. However the only water we saw all day was in this canal. No need for that rain gear. The sun got brighter and brighter as the day progressed. There was some cloud cover, so we had occasional respite from direct sunshine, but we felt the heat anyway. At about 9.30am we turned onto Jalan Sungai Panjang. Why did the squirrel cross the road? Jalan Sungai Panjang, or Long River road, is appropriately named. We were on it for 40km / 25mi. That is not the river on the left by the way. Sungai Bernam is a couple of kilometers to the left of this road. That river demarcates the border between the states of Selangor and Perak, starting from the river mouth on the west coast and meandering 90km / 56mi or so eastward to Tanjung Malim. Before long some of the group got bored and upped the pace. The rest of us followed for about 10km / 6mi before letting the faster riders go. We needed a break. Mark spotted a stall in the midst of the oil palm trees. Literally in the middle of nowhere. Just what the doctor ordered. We cruised the remaining 17km / 10.5mi to the second check-point at Kampung Soeharto, posing for some GoPro shots along the way. And enjoyed the shade beneath the clouds where we could. The first order of business upon arriving in Kampung Soeharto at 11.30am was to get our brevet cards stamped by a group of cheerful volunteers. Then it was time for lunch. The brevet organisers had warned us that there was no food or drink to be had for 40km / 25mi beyond Kampung Soeharto. We crowded into Laila Restaurant for chicken rice and lime juice. We spent about an hour in Kampung Soeharto. It was almost 2pm by the time we got to the outskirts of Batang Berjuntai. The first sign of refreshment after the previous bone dry 40km / 25mi was a roadside stall selling coconut water. We made one more stop at the PETRONAS station at Simpang Tiga Ijok. That was only 10km / 6mi from the coconut water stall, but it didn’t take long in the 35° C / 95° F heat for us to want more cold drinks and some time in air-conditioning. At that point most, if not all, of my buddies had ridden further than they had on their previous longest rides. I was in new territory also. Despite having ridden 190km / 118mi we were all still in good shape. Tired and a bit sore perhaps, but no one was cramping. Our decision to ride conservatively (there was one collective rush of blood to the head before our Coca Cola stop, but that turn of speed didn’t last very long) had paid off. I was certainly feeling better at 190km on this day than I remember feeling at 100km / 62mi on a number of previous rides. We also had the good fortune of not suffering any mechanical problems. Not a puncture amongst us. Respect to this gentleman, who finished the ride solo on a tandem that had suffered a broken rear wheel spoke. Thereby embodying the self-reliance that the Audax culture prizes. External support is expressly prohibited in the Audax rules, and if you go off course or experience a mechanical, you are expected to take responsibility for finding your own way home and making your own repairs on the road. With ‘just’ 30km / 18.5mi to go, we lost our conservativeness. Our average speed went up by at least 4kph / 2.5mph as we pushed for the finish. This despite riding over the poorest road surface of the entire route between the 200km / 124mi and 215km / 133mi points. The organisers had been forced to make a last-minute change to the end of the route, to avoid presumably worse conditions. The roads on the rest of the route were by and large in good to very good condition. 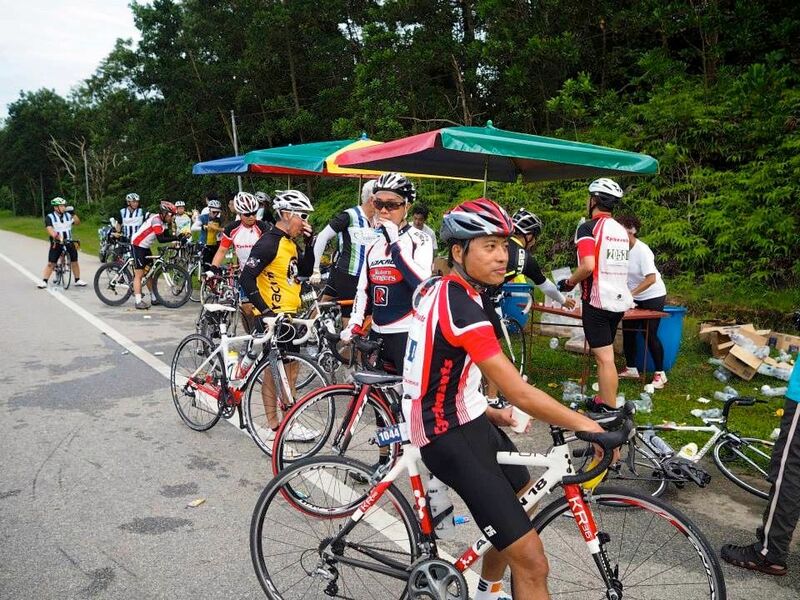 Audax Randonneurs Malaysia did a terrific job putting this event together. Kudos to the committee members. And a heartfelt shout-out to the volunteers who distributed and stamped the brevet cards. All the information that went out ahead of the event was very helpful. In particular the cue sheet and photographs of the turns along the route, like this one. All my buddies and I finished the ride in about 10 hours 45 minutes. Well within the time limit of 13 hours 30 minutes. 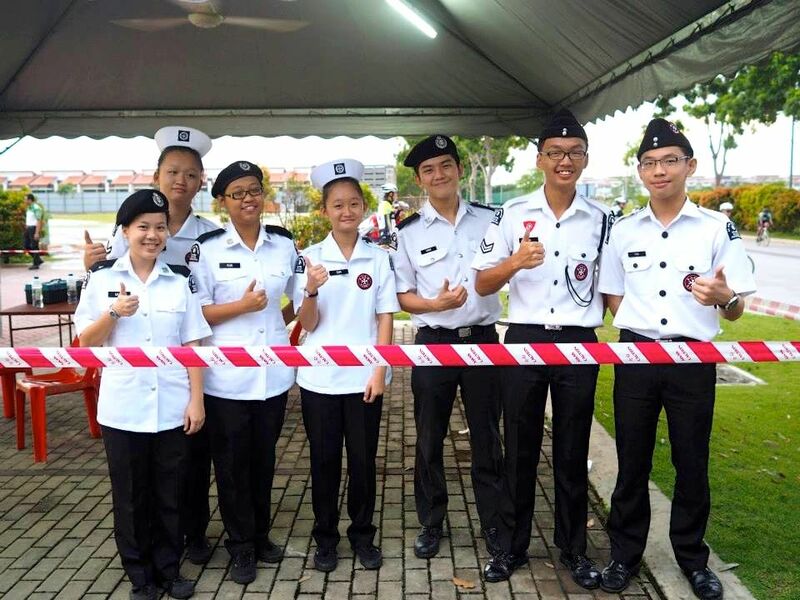 As did this group, which rolled into the final check-point at the Kapar KFC about 8 hours after they started. In the spirit of Audax, all 389 of us who finished the event before 6.30pm, including getting to the check-points on time, were successful. One last stamp on the brevet card. We are all very pleased with our achievement. I think all my riding buddies joined me in stumping up the cash to get a 200km medal from the Audax Club Parisien, the body that administers randonneuring around the world. This will be quite a memento. Video courtesy of Sam Tow. 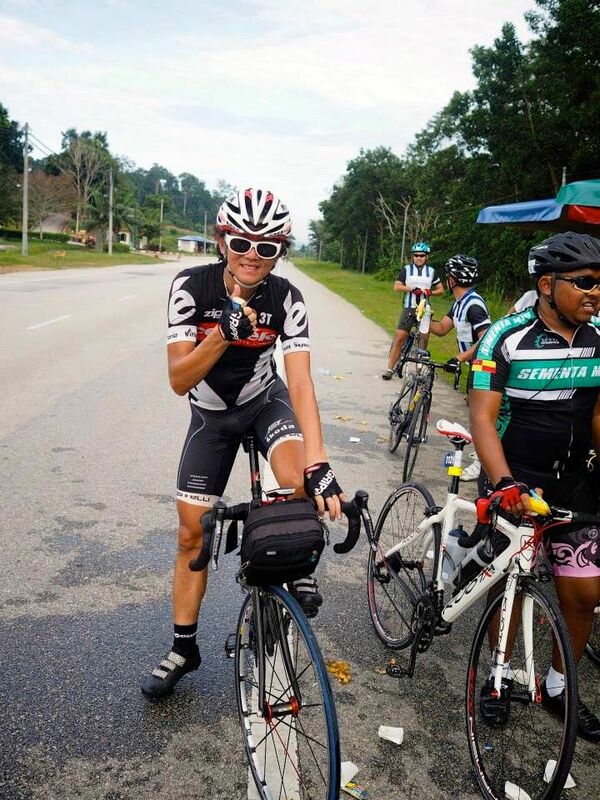 Posted in Cycling in Malaysia and tagged #‎audaxrandonneursmalaysia‬, Audax, Batang Berjuntai, Brevet, Heat, Kampung Soeharto, Kapar, Randonneuring, Randonneurs, Sekinchan, Sungai Besar. Bookmark the permalink. The final organized ride of the year for my riding buddies and I was a 125km / 78 mi charity event in aid of St. John Ambulance and Mission for Missing Children. 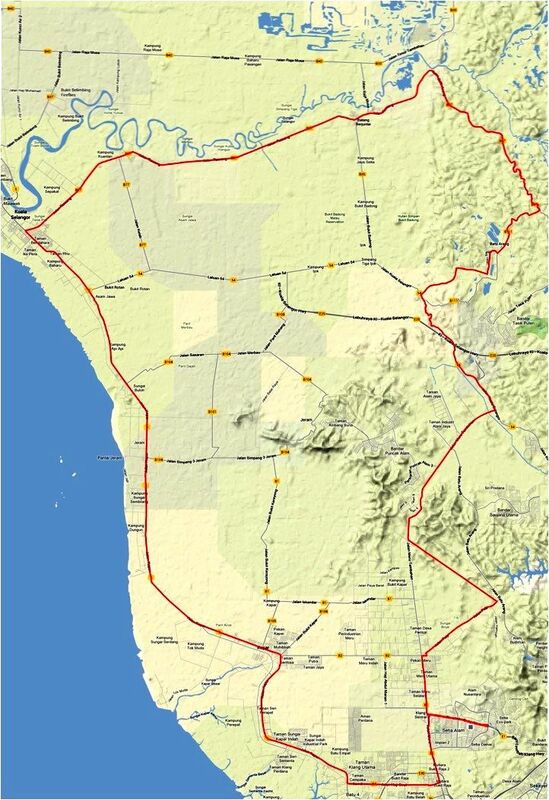 The route ran clockwise from Setia Alam to Kapar, and then north to Kuala Selangor. There we turned right onto Jalan Rawang and followed it through Batang Berjuntai before turning right again onto Jalan Batu Arang for the southward leg back to Setia Alam. 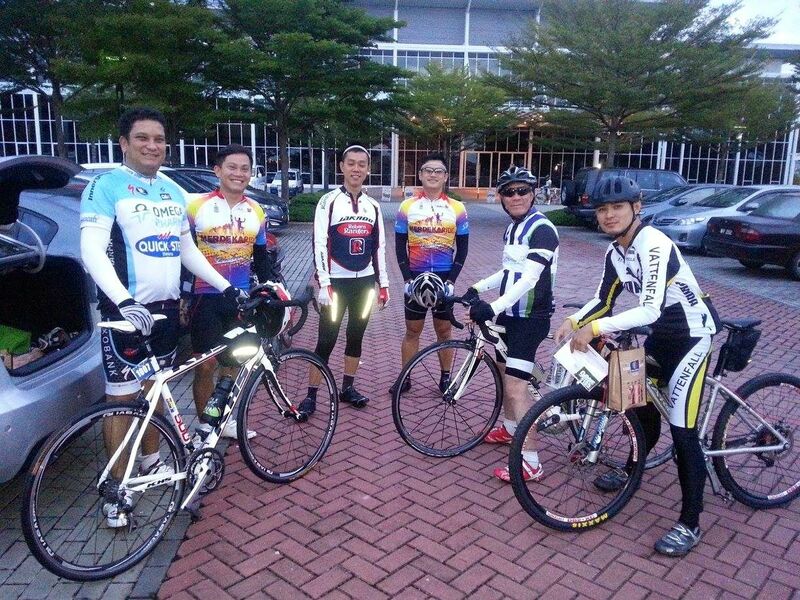 It wasn’t a particularly big group that gathered in the Setia Alam Welcome Center parking area at the crack of dawn. About 350 of us were at the start to listen to the pre-ride briefing from Chan Chee Seng. Chee Seng was a familiar face from my past. 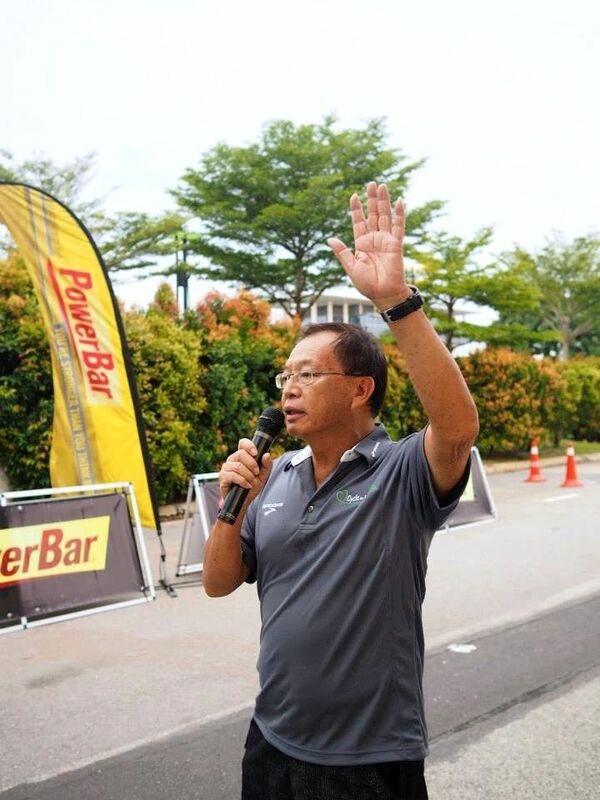 The last time I met this accomplished sporting figure (he represented Malaysia in swimming at the 1964 Tokyo Summer Olympics, went on to become a successful coach, and then launched a second sporting career, becoming the first Malaysian to participate in the Kona Ironman World Championships in 1995) was about forty years ago. Most of the usual suspects in our group did this ride. Raj, Mark, Chris, Marco, Keat, and a friend almost ready to roll. Marvin, Griffin and Chon were also there. Gary rode too, but he didn’t make it into the start line photographs. The first 65 km / 40 mi were as flat as the proverbial pancake. Just one highway overpass to get over as we hummed along at 35 kph / 22 mph. We grabbed bottles of water on the go (how pro is that?) at the first water zone at the 40 km / 25 mi point. This was the road we were on between Kapar and Kuala Selangor. We hit the first of the lumps on the route after 65 km / 40 mi, as we entered Batang Berjuntai. That sudden 20 meter / 66 ft climb took so much out of us that we had to stop at a 7-11 for a break! Where we were joined by a fellow rider in need of some rest and refreshment. Marvin and Chon caught up to us at the 7-11. 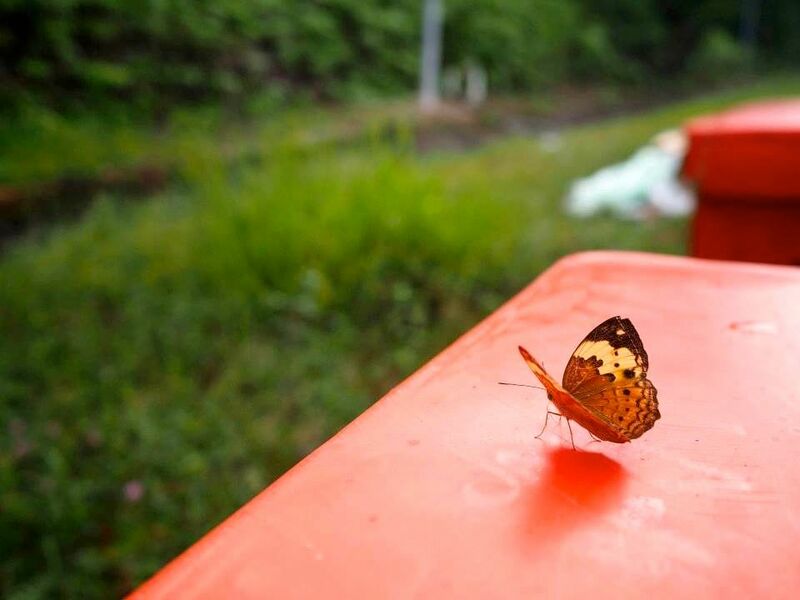 We had been told that the next water stop was after 90 km / 56 mi. So we were surprised to come across it just 7 km / 4 mi later. That didn’t stop us from partaking of the PowerBars and bananas on offer. As well as enjoying a touch of Mother Nature. Most of the excellent photographs in this post come courtesy of this gentleman. He was on his bike with his DSLR camera in his right hand, taking photographs as he rode. Fantastic. Perhaps the organizers moved the stop so that we could refuel before the route turned really hilly. Which it certainly did. We had about 225 meters / 740 feet of climbing in the next 20 km / 12 mi. Then there was a respite for 15 km / 9 mi before we came to the part of the ride that we were all dreading. The Dragon’s Back. 100 meters / 330 feet of elevation over 5 km / 3 mi, with a 12.5% pitch on the last climb. The profile looks like this. This is the view back down the last hill. By the time most of us got to the Dragon’s Back it was noon. It had been a warm, albeit overcast, morning to start with. The temperature kept rising throughout the morning, and by midday the heat index was pushing 34° C / 93° F. Everyone in our group had to battle cramps at some point during the ride. The remainder of the ride was thankfully flat. Even so it felt like a long 11 km / 7 mi to the finish. I suspect that more than a few riders were grateful for the assistance from the St. John Ambulance volunteers during and after this ride. Everyone in our group made it to the finish on their bikes rather than in a support vehicle, despite the heat and the cramps. This was the longest ride to date for Chon, Gary and Raj. So they more than any deserved their finisher’s medals. 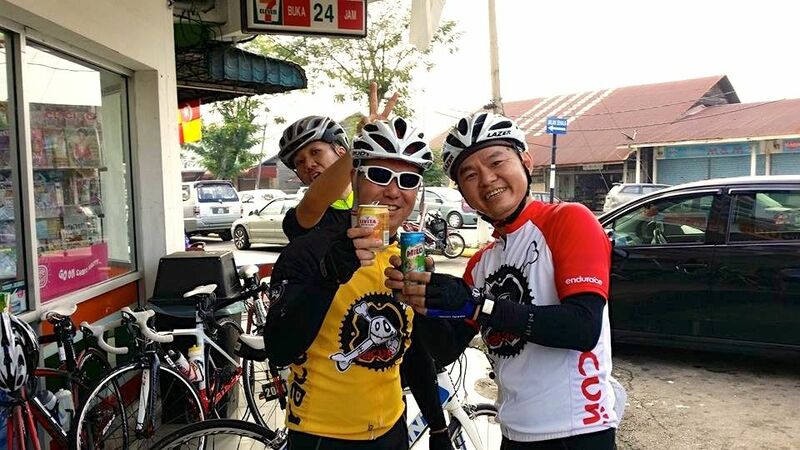 Posted in Cycling in Malaysia and tagged Batang Berjuntai, Cycle For Life, Dragon's Back, Kapar, Kuala Selangor, Setia Alam. Bookmark the permalink.